inner package 1 kg in a water-proof plastic bag. 2). When quantity is large, they can be packed with pallet like below. good quality with competitive price, we win a great deal of popularity and trust. 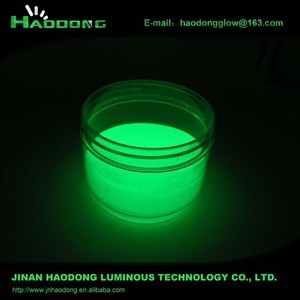 Jinan Haodong Luminous Technology Co., Ltd.
5. At last, the proportion of glow powder used for injection is generally 3%-10% . 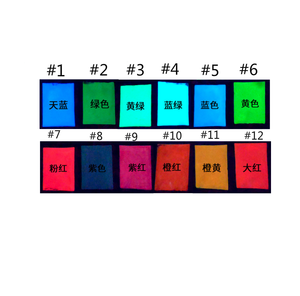 A: Glow color in the dark: Blue, green, red, orange ,white, azure, 8 colorful. But if quantity is more, price and shipping cost have a discount. 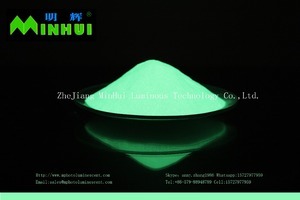 L&B Photoluminescent pigment available glow in the dark more than 12hours. When all power is break, the photoluminescent indication marks and escape system still work. Decomposed in acid and reaction products are safe to environment and human. Qingdao Roadsun Titanos Co., Ltd.
3. What is the cost for sample9 Reply: Our Company provide catalogue and sample for free. But customer needs to pay express fee for pearlescent pigment . How to contact us9 With 8 years OEM exprience, we can provide professional solutions for customers. Under norm DIN67510 , the pigments glow more than 20hours, some items even glow for weeks. Q3 - How bright of your pigment9 A3 - The glow brightness of pigments is different from each other. Q4 - How to use your photoluminescent pigment9 You may browse our using guideline published on webpage . 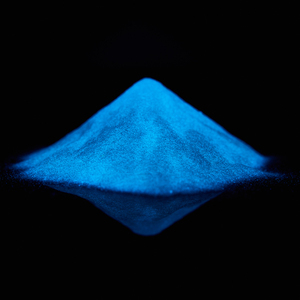 Detalied information: Luminescent pigment ,Photoluminescent pigment is a new type of luminous material. 5. Metal material affects the performance of light, please avoid to touch the metal material. 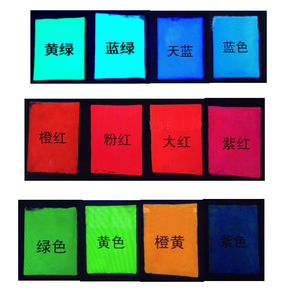 Metal material influence luminescent pigment, so prevent pigment from touching metal material direct. Feature: 1)Short Storing-light time:10-20 min; 2)Long afterglow time:Over 12 hours; 3)High luminance:40-90mcd/square meter after 60 min; 4)Wide excitation wavelength:200-450nm,e.g. visible light, Lamp light,UV light; 5)Recycle time:More than 10 years; 6) Use: Glow in the dark place for hours after recharged by sunlight, lamp light, UV light for 10~20 minutes, as the the guide sign for peaple. Application: 1)As additive in transparent medium: paint, ink, plastic, rubber, resin, fibre, printing slurry. 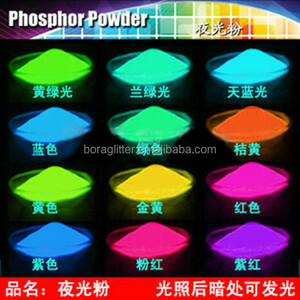 Features & Characteristics of glow in the dark pigment powder : 1. Weather resistant. 2. What is the minimum order quantity9 The minimum order quantity depends on the product range. 4. What's the delivery period for one order9 If we have products in stock, it takes less than 2 weeks. Glow in the dark pigment We are factory with over 6 years experiences, with individual Production, R & D, Sales, QC Department. Kindly note that our holo pigment are in paste form, we make it by ourselves with all materials are made in China. It has an annual production capacity of more than 2,000 tons, specializing in the development and production of pearl pigments. This occurs when electrons absorb energy in the presence of light and move up to a higher orbit. We have many different grade of glow in the dark powder use for different usage. They come in a variety of colors and different particle sizes to suit many requirements. This magic pigment absorbs light and then re-emits it over a length of time. This occurs when electrons absorb energy in the presence of light and move up to a higher orbit. In the absence of light energy, these same electrons fall from a higher energy level to a more stable energy level. 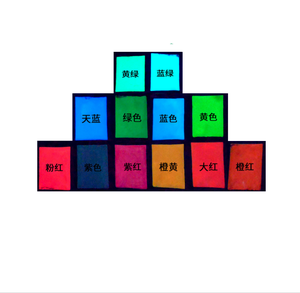 This product is non-toxic, harmless and non-radioactive , and can be applicable to instrument panel display, night indication signal ,artwork ,daily consumables and sports utilities. 2.How long can be delivery9 It will be sent in 1 or 2 days if the goods in stock. It will be sent in 4 or 5 days if it is not in stock. 3 . 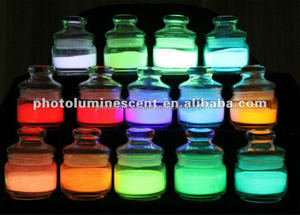 Dalian Lightleader Technology Co., Ltd.
Photoluminescent paint Glow in the dark powder Our advantages: 1. We have engaged in this line for more than 10years. 2. Advanced machine tools and qualified personnel enable us to provide top quality products with most competitive price and best service. A pplication : A s additive for coat, paint, silk screen printing ink, plastic, ceramics, glass, yarn, resin rubber, and safety signs, etc. 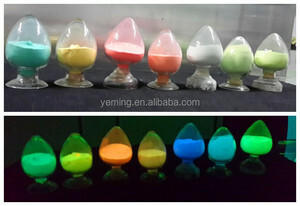 Alibaba.com offers 3,855 glow in the dark powder products. About 66% of these are pigment, 3% are road marking paint, and 3% are building coating. 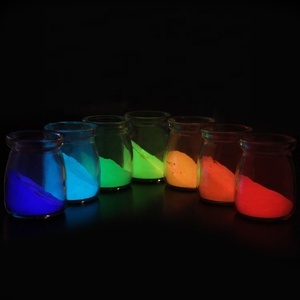 A wide variety of glow in the dark powder options are available to you, such as free samples, paid samples. 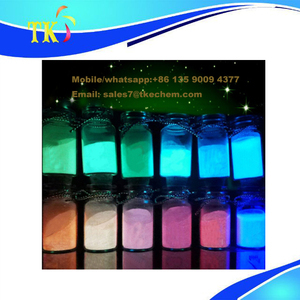 There are 3,857 glow in the dark powder suppliers, mainly located in Asia. The top supplying countries are China (Mainland), United States, and India, which supply 98%, 1%, and 1% of glow in the dark powder respectively. 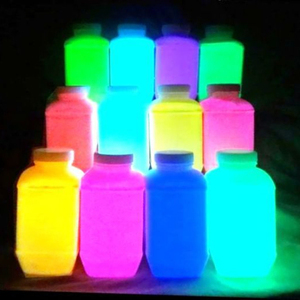 Glow in the dark powder products are most popular in North America, Western Europe, and Domestic Market. You can ensure product safety by selecting from certified suppliers, including 582 with ISO9001, 302 with Other, and 181 with ISO14001 certification.